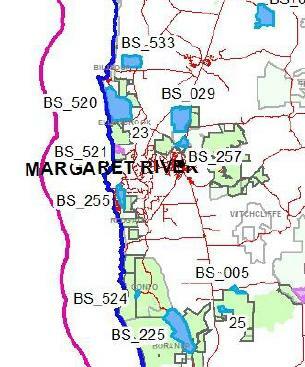 The Habitat Advocate » Blog Archive » State Arson of Margaret River = Class Action! 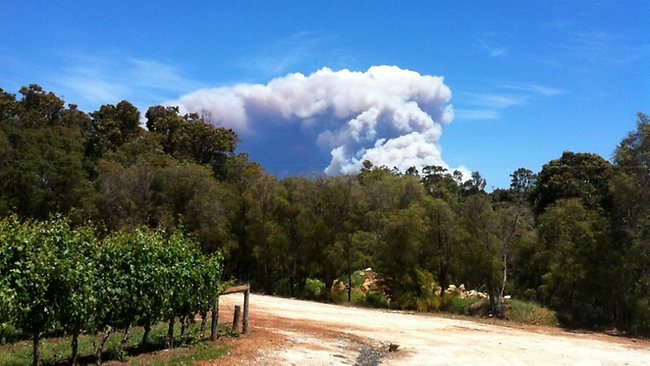 State Arson of Margaret River = Class Action! ‘It’s only bush, she’ll be right’ – famous last words by bushfire management, and not a wildlife zoologist among them. “All my bits and pieces that make me are gone,” says Marjorie Stewart, who lost her home in the raging bushfire in Margaret River. Here we go again. Every year, prescribed burns get out of control somewhere across Australia, yet the State culture of lighting fires to mitigate wildfires continues unquestioningly. No thought is given to the consequential killing of Australian wildlife and the destruction of ever-shrinking islands of habitat. To wildlife it is arson. Is it any wonder why Australia has the world’s worst record in local fauna extinctions. But it is when human lives and human property are damaged that bushfires make the human headlines. The current Margaret River Bushfire’ is a consequence of yet another ‘escaped burn’ in the litany of bushfire management’s perverted ‘strategic bushfire protection‘. Some protection! Lighting bushfires is arson. Letting a bushfire burn remotely overnight for 80 nights is grossly reckless neglect. The consequential human cost and community cost is the responsibility of the State. Local farmer near the WA town of Denmark Tony Pedro is angry at what he says are government-sanctioned burns which get out of control and threaten private property. Mr Pedro says it is time authorities in WA changed their fire management policy from one of ignition to suppression. ‘Silvicultural burns for regeneration of native forests following timber harvesting’. You see, Australian native vegetation burns, so burning it must be good for it. As for the wildlife, well we think they come back, but we don’t really check. DEC’s Master Burn Planning for the three year period 2011-2014 began in Spring. Tue 6th Sep 2011: The ignition? Anecdotal evidence from various online media reports suggests that DEC’s prescribed burning was occurring within the nearby coastal Leeuwin-Naturaliste National Park. So DEC, the custodian of National Parks in Western Australia, set fire to the National Park. So it is likely the magnificent tall stands of Karri and Jarrah forest, that characterise areas of the Park, have been burned? The coastal scrub-heath and large peppermints and banksias which provide habitat to a variety of native mammals including the Southern Brown Bandicoot, Western Grey Kangaroos, Common Ringtail Possum and Brush-tailed Wallabies – have they been burned too? What of the native birds of the Park including the Red-eared Firetail, White-breasted Robin, Rock Parrot and Emu? How much of this important dedicated wildlife sanctuary has been incinerated and disclocated by the custodian charged to protect it? And why? High level satellite photo shows a clear plume of smoke along the coast indicating a strong NNW wind. At the time of compiling this article (20111125), no clear and definitive map of the progress of the bushfire zone was available online. The following map is indicative, but it is known that the coastal village of Prevelly to the south was affected, so not too much reliance can be placed upon this aerial map. winds, easing during the evening. Friday: Areas of morning drizzle in the southwest. Moderate W/SW winds. Fire Weather Warning issued for Stirling-Inland subdistrict. Remainder of Thursday: Partly cloudy. Moderate N/NE winds. thunderstorms developing during the afternoon. Moderate W/SW winds. Outlook for Saturday : Isolated areas of drizzle in the far west in the morning. Isolated showers and thunderstorms over the central and eastern parts in the afternoon. .Clearly DEC’s prescribed burn by yesterday (24th Nov) the bushfire(s) around Margaret River had been burning for some 80 days. When had they got out of control? What measures were put in place to handle increase in wind speed? Clearly it was imprudent to allow a bushfire continue for 80 days. When had the decision to suppress been taken? When prescribed burns escape and get out of control (which across Australia is all too frequent), this is more than a tactical misjudgment. It is becomes a bush arson gamble gone wrong. Then more than 30 homes are destroyed as a direct consequence, this is gross culpable negligence. How dare Premier Colin Barnett then offer those who lost their homes in the Margaret River bushfire a measly $3000 compensation each from the State government. Add three zeros – to each affected household! All affected by loss should collectively seek redress and compensation for all economic loss and trauma and file a class action against DEC and the State Government. Dare to set a precedent! Hip pocket strategy is the best way to put an end to government negligence! During September, DEC’s prescribed burning spring was in full swing across Western Australia. Opposition Leader Eric Ripper questioned whether DEC had been under political pressure to complete an extraordinary number of prescribed burns before the official start of the bushfire season on December 1. [Source: ‘WA Premier admits failures on Margaret River fire’, by Nicolas Perpitch and Paige Taylor, The Australian, 20111125, ^http://www.theaustralian.com.au/national-affairs/politics-news/wa-premier-admits-failures-on-margaret-river-fire/story-fn59nqld-1226205457331]. DEC Principal Fire Operations Manager, Terry Maher, has more or less confessed that DEC fast-tracked this planned prescribed burn. Maher has said that wet weather in October prevented the Department from concluding the prescribed burn sooner. “It would have been absolute negligence if we hadn’t had a crack at trying to complete it because the result would have been the same,” he said. On 15th September, the biggest controlled burn in WA’s history was reported underway on the Nullarbor plain, with DEC setting fire to 660,000 hectares (80km x 80km) of native grasslands. 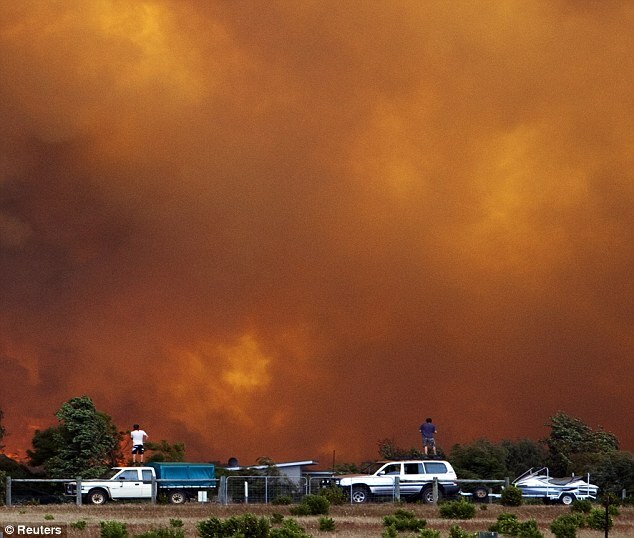 [Source: ‘Nullarbor goes up in smoke‘, ABC Rural, by Tara De Landgrafft, 20110915, ^http://www.abc.net.au/rural/wa/content/2011/09/s3318617.htm?site=perth]. The bushphobic logic was that recent rains had generated natural regrowth, which is demonised as bushfire ‘fuel’, so best burn it in case it burns. No thought was given to the consequential killing of vulnerable fauna native to the Nullabor grasslands such as the Yitjarritjarri (Notoryctes typhlops), Sandhill Dunnart (Sminthopsis psammophila), Bush Stone-curlew (Burhinus grallarius) and Malleefowl (Leipoa ocellata). Interesting how the same logic applied to flammable native vegetation is not applied to flammable pine plantations. Why? The latter is valued, the former is not. Throughout September, October and right up until 23rd November 2011, no mention can be found online of any news about the supposed continuing prescribed burn in the Margaret River Area. So up until this time one may presume that the prescribed burn in question was either under control, or otherwise out of control in remote bushland and not reported to the media. On Wednesday 9th November, the local newspaper, the Augusta-Margaret River Mail, had reported a landowner in the Prevelly area burning off a pile of branches, which had escaped due to a sudden wind gust and then burning about 400 square metres of surrounding grass and scrub. The fire was supposedly extinguished. Brigade captain and fire control officer for Prevelly, Brett Trunfull, was quited at the time as saying: “Obviously we are happy to see people burning off their piles, but they must do it within regulation“. The article stated that permits for burning piles were permitted in the area up until midnight on 21st November. [Source: ‘No permit, no burn‘, by Tom Nelson, Augusta-Margaret River Mail, 20111116, ^http://www.margaretrivermail.com.au/news/local/news/general/no-permit-no-burn/2360451.aspx] Editor: Is this a wise practice? The Keelty Report into the Perth Hills Bushfire of February 2011 (released 17th August 2011) highlighted damning inadequacies in the State’s ability to respond to major bushfires – including a lack of appropriate equipment, poor and mismatched radio communication systems, and difficulties in the interaction between the agencies responsible for responding to fires. The Report made 55 recommendations, of which thus far, the Barnett Government has implemented just nine. In the weeks leading up to the Margaret River Bushfire, strict new firebreak and fuel hazard reduction notices had been issued in October to property owners in towns and subdivisions throughout the Augusta-Margaret River Shire, including those in Augusta, Margaret River, Witchcliffe, Rosabrook, Cowaramup, Gnarabup, Prevelly, Gracetown and Molloy Island. Property owners who failed to comply with the notice requirements risked a $5000 fine plus the additional cost of paying for a contractor called in by the council to clear their land. Co-ordinator of council rangers Gavin Jennion said that from 6th December 2011: “We will begin inspecting the high risk areas first – places like Prevelly, Gnarabup, Gracetown and Molloy Island where there is only one road in and out.” [Source: ‘Fire hazards may cost land owners’, by Mal Gil, Augusta-Margaret River Mail, 20111102, ^http://www.margaretrivermail.com.au/news/local/news/general/fire-hazards-may-cost-land-owners/2344773.aspx?storypage=1]. Clearly, many of these property owners have now incurred an immensely far greater personal cost. In early November, near the township of Nannup, about 60km west of Margaret River, a suspicious bushfire was reported which was quickly suppressed by DEC. It burnt out an estimated 67 hectare of bushland. Also around the time of the Margaret River bushfire flare up, nother prescribed burn at Mount Lindesay National Park, north of south coast WA township of Denmark went out of control. 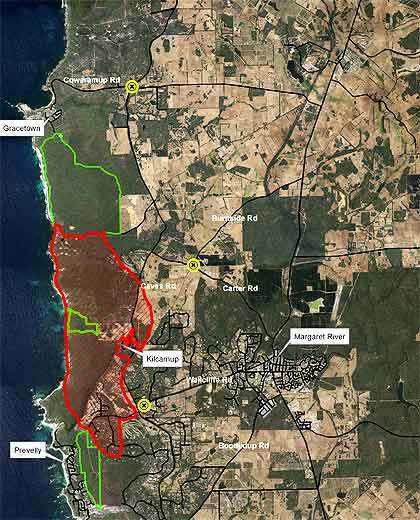 Apparently, the fire started after embers from the still smouldering burn-offs became airborne and ignited in surrounding scrub and began threaten properties along the north-south running Caves Road, west of the township of Margaret River. 7.28pm: Police Commissioner Karl O’Callaghan has told ABC Southwest Radio the current plan was to make sure there were enough resources on the ground for tomorrow. 7.40pm: There have been conflicting reports just how many properties have been damaged or destroyed in the fire but according to FESA chief executive Wayne Gregson 21 houses, nine chalets, five sheds and two other buildings had been damaged. 7.46pm: The latest alert from FESA advises the potential for severe bushfire behaviour still exists. “The fire has crossed the Margaret River mouth and is currently impacting Prevelly and the south-eastern edge of Gnarabup townsite. “Spot fires have developed in the vicinity of Terry Drive and are burning aggressively in a south easterly direction and have crossed Redgate Road in the vicinity of Redgate Beach. “Winds are moving westerly during the evening, with conditions easing. Homes are still at risk of being damaged by the fire and you need to keep up to date. According to FESA the blaze is likely to have burnt through about 2400 hectares. Firefighters are actively engaged in firefighting at Prevelly, Cherry Road and Burnside Road. Western Power crews are working to re-establish power. 8.05pm: While cooler conditions tomorrow are predicted to make it easier for firefighters to control the fire FESA has just issued a severe fire danger advice for parts of the South West land division. A full list of towns and shire in the region can be found at www.fesa.wa.gov.au Residents are urged to stay alert and watch for signs of fire, especially smoke and flames. 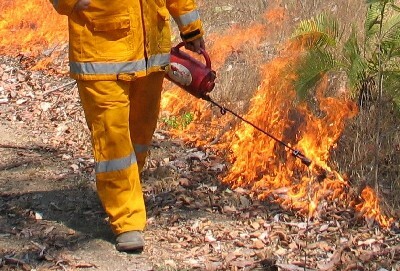 Have your bushfire survival plan and kit ready. 8.56pm: We are going to wrap up tonight’s coverage now but will be back nice and early in the morning. Visit www.fesa.wa.gov.au for further updates. A Total Fire Ban has been declared tormorrow, Friday, for the shires of Augusta-Margaret River, Busselton, Boyup Brook, Bridgetown-Greenbushes, Donnybrook-Balingup, Manjimup and Nannup. 7.05am: Evacuation centre that ”it’s still pretty sleepy”, with dozens of people resting, many of them still uncertain whether they have lost their homes in the fires. 7.33am: The Insurance Council of Australia has declared an insurance catastrophe for the bushfires currently burning around Margaret River. Chief executive Rob Whelan said it was too early to quantify the damage caused by the fires, but expected it to be in the tens of millions of dollars. 8.48am: A Bureau of Meteorology spokesman said the temperature at Margaret River was currently 28 degrees, with humidity at 25 per cent. The spokesman said the winds were currently north north-easterly up to 30km/h with gusts up to 35km/h. He said that during the day the winds would be about 40km/h with gusts up to 60km/h, changing to north north-westerly through the afternoon. The Bureau has forecast a maximum temperature of 30 degrees for Margaret River today. 9.35am: Wayne Gregson, chief executive at FESA confirms on ABC Radio that so far 10 homes, nine cottages and five sheds have been completely destroyed, and two more homes have been badly damaged. He said the fire was between 85 and 90 per cent under control, but that this meant that overall it was still out of control. “Prevelly is under threat. Our focus is on Prevelly in terms of homes and people,” he told ABC Radio. He said he had “significant resources” at the scene ahead of blustery winds expected to hit the South-West this afternoon. 10.18am: A community meeting is currently underway at the Margaret River Cultural Centre. The crowd is spilling out of the centre as hundreds of people attempt to get the latest information. DEC incident controller Roger Armstrong is currently addressing the crowd, who are voicing their frustrations at the lack of information. Residents are shouting out for information on road closures and how many homes have been lost. Mr Armstrong has told the crowd that “we’re not out of the woods here today” and that Prevelly Park was still the main concern for firefighters. 10.45am: Prevelly Park remains the area about which authorities are most concerned. DEC incident controller Roger Amstrong said the fire was 80 per cent contained but if winds changed, there was a significant risk for communities west of Margaret River. 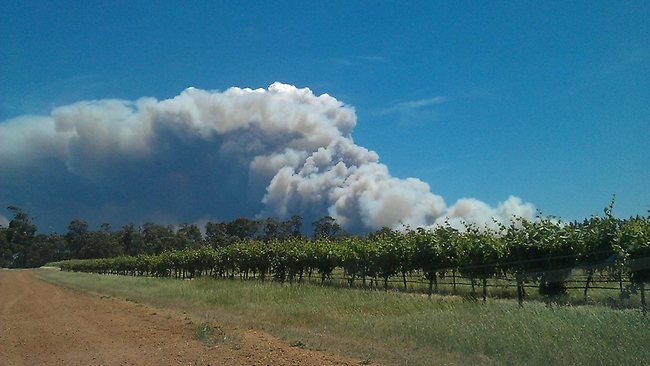 11.27am: Roger Armstrong, DEC’s incident controller told ABC Radio that an evacuation has been ordered for people in a rural subdivision north of the Margaret River as the bushfire front continues to move. He said FESA and DEC would be evacuating residents about four to five kilometres ahead of the frontline as the blaze continues to move with the north north-easterly winds. He said the subdivision, north of Harrington Road, south of Burnside Road, west of Sandpit Road and Boodjidup Roads was the next to be evacuated as a precaution, and said they were in no immediate danger. Winds in the area are currently about 40km/h, with gusts up to 60km/h. 12.38pm: Two more fires have been declared out of control around the state, with six homes in Martin, in the City of Gosnells currently under threat. The fire is burning between Versteeg Grove and Feldts Road, and residents are being urged to evacuate in the immediate vicinity. FESA have also warned of a fire that broke containment lines near Denmark. 1pm: 140 people find safety in emergency welfare centre ‘Margaret River Cultural Centre on Wallcliffe Road’, intended for Margaret River people who have had to relocate from their homes because of the bushfire, and were being provided with food, care and a place to sleep. 1.18pm: The latest update from FESA: A bushfire emergency warning remains in place for people in the Kilcarnup subdivision, Prevelly and Wallcliffe subdivisions and the area north of Wallcliffe Road and east of Caves Road. An evacuation has occurred in the following areas: south of Burnside Road, north of Harrington Road (also called Exmoor Road), west of Umberto, Kevill, Sandpit and Boodjidup Road. FESA are advising people in this area that it is too late to leave, and they need to take shelter in their homes and actively defend their properties. A bushfire watch and act has been issued for people in the greater fire area, including the localities of Ellensbrook, north-east of Kilcarnup, south of Prevelly and east of Caves Road. 1.26pm: Mirambeena Aged Care Facility in Margaret River has been evacuated this afternoon. 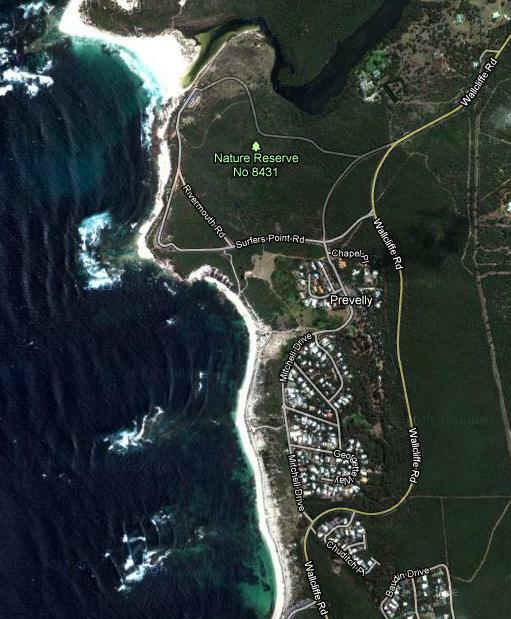 1.32pm: Several reports via Twitter that the fire has now crossed the mouth of the Margaret River. Still awaiting official confirmation but doesn’t sound good. If it’s true, many more homes are likely to be under threat. 1.59pm: The fire seems to ramp up as a 100 square-kilometre area south-west of Margaret River is being evacuated, and the blaze is now burning in Prevelly, the DEC told the media scrum. 3.00pm: About 30 people stranded on the beach near Prevelly and Gnarabup are being evacuated by jet ski as the fire pushes towards the coast, a resident whose son has been called to help. He said all jet skis in the area had been called to assist. Only an hour earlier the department had said the beach was the safest place for them to be and that evacuating them would draw resources away from battling the fire. 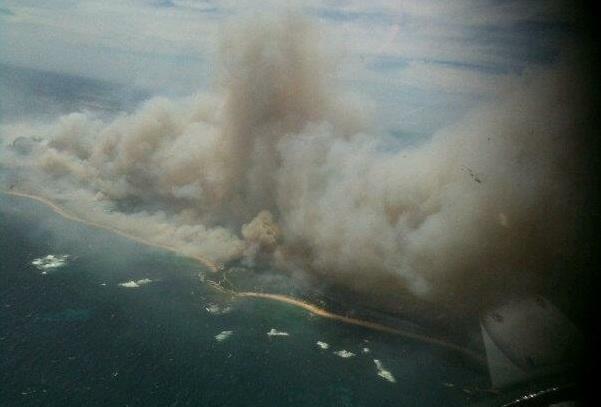 The blaze crossed the Margaret River at Surfers Point Road earlier this afternoon. 4pm: WIN news reported flames up to 10-metres high have been spotted as more than 100 firefighters work into the evening to extinguish the blaze. Ryan Jose told reporters all residents could do was “hope it [the fire] doesn’t burn your house to the ground” while Sam Kinney said residents would be pointing their finger at DEC. “DEC has a lot to answer for” said Mr Kinney. Residents have told ABC SouthWest radio there is a lot of smoke in the area with one listener saying “it’s very scary”. Another listener has vented her frustration at DEC for burning off on “a day like today” so close to homes. Olivia who owns some horses has had to take the animals to the local showgrounds and said there is lots of smoke but has yet to see any flames. She was concerned about the change in the wind which may push the fire toward her property. According to Olivia the townsite was very full with people congregating in the park and in cars as they waited for more information. More than 100 fire personnel and 30 fire units from the Department of Environment and Conservation, Fire and Rescue Service and local volunteer bushfire brigades are on the scene. Two helicopters and two fixed-wing water bombers are assisting ground crews. He said almost 100 volunteers were on the scene. According to DEC the fire is moving in a south-westerly direction towards Ellen Brook homestead at around 200 metres an hour. It is out of control and unpredictable. There have been unconfirmed reports the homestead has been damaged. Firefighters are expecting the wind to change from north-east to north-west about 5pm. This means properties to the east of Caves Road and south of Ellen Brook Road may be impacted by the fire and residents need to keep up to date. So far more than 1000 hectares have been burnt. 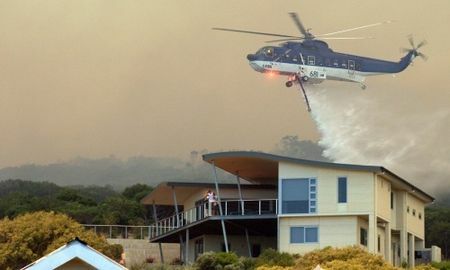 [Source: ‘Fire threatens Hills home’, by staff reporters, Perth Now, 20111125, ^http://www.perthnow.com.au/news/western-australia/wa-fires-fire-threatens-hills-homes-s-w-resort-at-risk/story-e6frg13u-1226205630864] . A bushfire emergency warning remains in place in WA’s Margaret River region, where 34 homes and holiday cottages have been destroyed by a prescribed burn that got out of control. The fires, which have been burning out of control for two days, has claimed 25 homes nine holiday chalets, including historic Wallcliffe House, built in 1865. However cooler weather today — and the possibility of some rain — either today or tomorrow is expected to help firefighters. Some residents are advised to leave their homes immediately if the way is clear but not to relocate at the last minute. The warning is directed at people in the area south of Carters Road, north of Forest Grove Road and Conto Road on the west side of the Bussell Highway, south of the industrial area. If they cannot leave, residents are advised to get ready to take shelter in their home and actively defend it. If they have prepared their property to the highest level and plan to use their home as shelter they are being advised to start patrolling it to put out spot fires. Twenty-five houses and nine chalets were lost to the fire on Wednesday and Thursday, and properties have been burnt or damaged at Prevelly, Gnarabup and Redgate, the Department of Environment and Conservation said in a statement early today. The Department of Environment and Conservation (DEC) said homes were still at risk and it was important for residents to remain up to date. 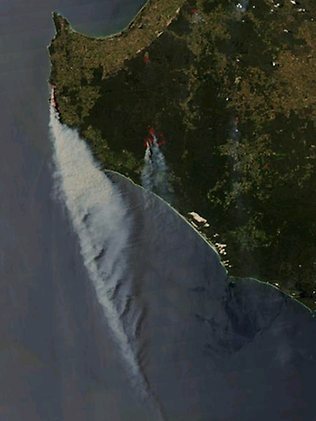 Yesterday the fire crossed the Margaret River mouth and burnt through parts of Prevelly and the southeastern edge of Gnarabup. Spot fires in the around Terry Drive resulted in aggressive fire behaviour south of Redgate Road. The fire is estimated to have burnt around 2800 hectares. According to FESA 27,000 hectares has been burnt since the fire was reported in the area at 10pm on Thursday. Thirty Fire and Rescue Service, Bush Fire Service and DEC firefighters from six stations are managing the fire. Western power said power had been cut along the Vasse Hwy between Stewart Rd and Seven Day Rd. Vasse Hwy has been close between Nannup and Pemberton. Late yesterday State Emergency Coordinator Karl O’Callaghan said fires were burning out of control in the several areas including Prevelly, where at least 30 properties have been destroyed and 2000 hectares razed after prescribed burning in the Leeuwin-Naturaliste National Park over the past 10 weeks sparked the widespread blaze on Wednesday. He said the State Emergency Management Committee had met on Thursday evening and determined no extra resources would be needed to fight the fires in Margaret River, Nannup and Denmark today. “We spoke about whether there would be more resources required, but we’re not expecting them to need more resources tomorrow,” he said. FESA spokesman Allen Gale told 6PR about 30 homes and about 10 sheds were severely damaged. He said the area of concern was Gnarabup and further south towards Redgate, where the fire was headed. Fifty-five people stranded on a Prevelly beach overnight had to be rescued by jet ski after the high bushfire swept through their coastal town. 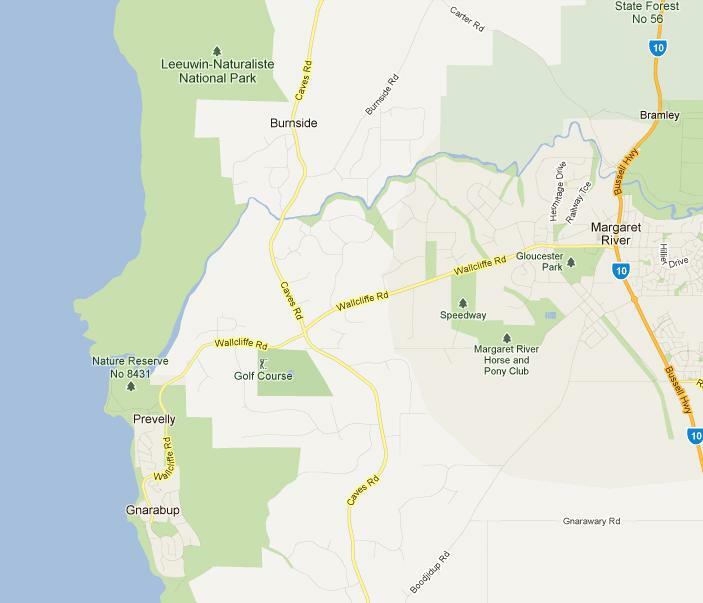 Reports firefighters were “holding back” a blaze which threatening Margaret’s Beach Resort in Gnarabup. Cooler temperatures and low winds are making the bushfire ravaging Margaret River easier to fight, although authorities say the fire is still not contained. More than 150 firefighters continue to battle the fire wall, which is 34 kilometres in perimeter. About 700 residents have gathered in Margaret River for the latest community briefing from emergency services about the fire. As more than 400 firefighters last night battled an out-of-control blaze in and around Margaret River, 233km south of Perth, Emergency Services Minister Rob Johnson conceded the State Alert fire system failed to send phone warnings to some residents until “after the fire had gone through their particular area”. Emergency services across the southern part of the state were stretched to capacity as the south coastal town of Denmark last night braced itself for a similar fire threat. Harvester bans were put in place across the state’s entire wheatbelt region while Perth sweltered in 37C heat, and spot fires across the city’s hills kept locals nervous and firefighters busy. The Margaret River fire has so far burnt 2400ha and destroyed or damaged at least 30 homes, including the historic Wallcliffe House, a 1865 riverbank manor restored by Woodside chairman Michael Chaney. A report by the community development and justice standing committee tabled in parliament yesterday found there had not been enough action taken on a recommendation for DEC, the Fire and Emergency Services Authority and local government to develop a single, integrated fuel-load management system. A DEC spokesman said the fire was “85 per cent” contained after engulfing1800ha, but if winds pushed the fire south-west this morning, houses in Prevellywere in danger. Extra firefighters would be deployed to secure that front of the fire, he said. “If we can get through the next couple of hours here, things are looking good”, the spokesman said. 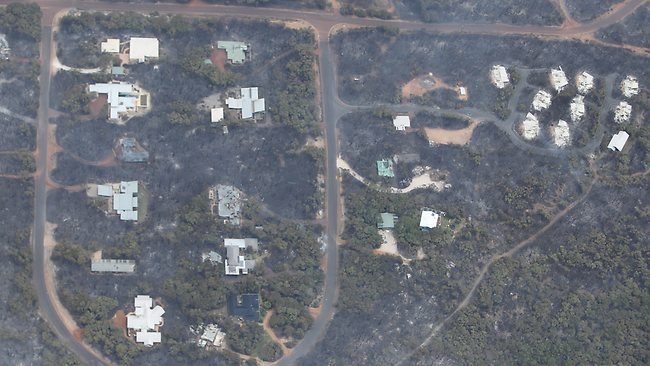 An estimated tens of millions of dollars worth of damage by Margaret River bush fires has been declared an ‘insurance catastrophe’. The Insurance Council of Australia chief executive officer Rob Whelan though it was too early to quantify the damage amount, they predicted it would be tens of millions of dollars. Sue the arsonist bastards, DEC and the WA Government, jointly in a community-wide class action. The ‘blame game‘ phrase is standard defence language of the culpable to try to divert accountability. When someone’s negligence causes your house to burn down, legal justice allows for fair compensation to the victims of negligence. If culpability is proven, compensatory damages are payable by the culpable to restore a victim to the position before the negligence. The fact is not one of discretionary moral blame. It is a fact of culpability. Most criminals will argue black and blue that they are never to blame. They will point to the system, to critics, to the messengers, even to the victims, to anyone but themselves. The Premier Colin Barnett has promised a full inquiry into the Department of Environment and Conservation’s handling of the Margaret River fire an hour after the department denied culpability. Barnett’s offer of $3000, to declare Margaret River a disaster area, to spend money on a full enquiry are standard means of government to capture and dissipate community anger so over time all will be forgotten and DEC and FESA business as usual may resume. DEC set fire to the environmentally protected Leeuwin-Naturaliste National Park. An untold because unknown number of wildlife have suffered and been killed, and perhaps causing or contributing to local extinctions – an independent (DEC-funded) zoological and ecological assessment is called for, with results to be made public. ‘Let’s see the end of these “Prescribed Burns”. Living in the foothills of Perth, every fine day during the winter months, you see that plume of smoke as CALM lights yet another fire, and in the morning the smoke haze can be seen in the distance, the excuse is to stop wild fires, therefore reduce loss of life and property. People choose to live in wooded areas and know the risks, I was one of them and loved the way of life until I had to come back to live in the burbs, with every hectare CALM burn. How many animals are killed or loose their homes, how many birds nests are burned down during their breeding season in Spring, and how many people with respiratory problems like myself end up sick because of the continuous smoke haze from “prescribed Burning”? Let’s start to do something to stop this legal arson. For goodness sake, doing a so called “prescribed Burn” on a 36 degree day with high winds is stupidity. The person who allowed it should be sacked and sued by the people who lost their homes. Couldn’t agree more! This entry was posted on Friday, November 25th, 2011	and is filed under Threats from Bushfire. The biggest active threat to any government body is the bureaucracy that controls it. They have little or no idea and seldom any experience of the coal face requirements. But then on the other hand they could have made it worse with all their hot air. Thanks for this in depth compilation of events… It helped me with my feelings of frustration, as I knew there are others out there taking this seriously. Please let’s not forget the other three or more fires still out of control that day from ‘prescribed burns’ – such as 27,000 hectares gone in Nannup (about eight times that of Margaret River), and yesterday it was still out of control. Thank you for your email and your personal feedback. Yes we take neglect in bushfire management very seriously. 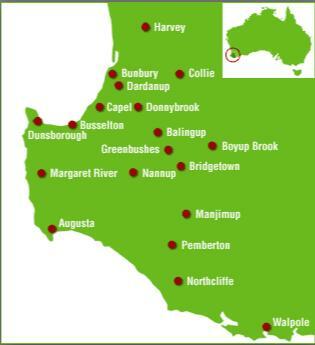 We have not forgotten Nannup. We shall be running an article on the Nannup Bushfire shortly.